Personal Log: Hello to everyone from Cicero, New York. Cicero is just outside of Syracuse in the middle of New York State surrounded by some very beautiful areas. 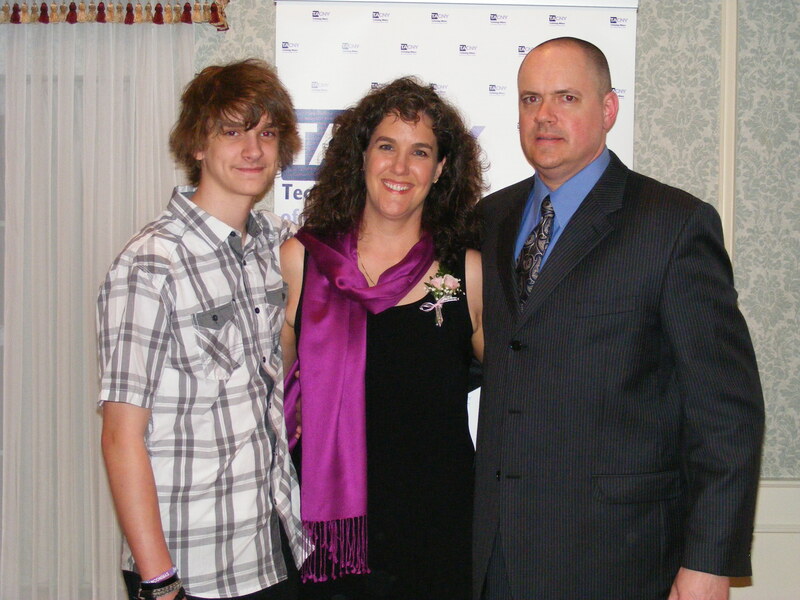 My name is Becky Loy and I have been teaching special education for 24 years. You might wonder, why is a special education teacher going to sea…? Well, I sort of joke that I am a special education teacher by day, STEAM (Science, Technology, Engineering, Arts and Math) enthusiast by night. 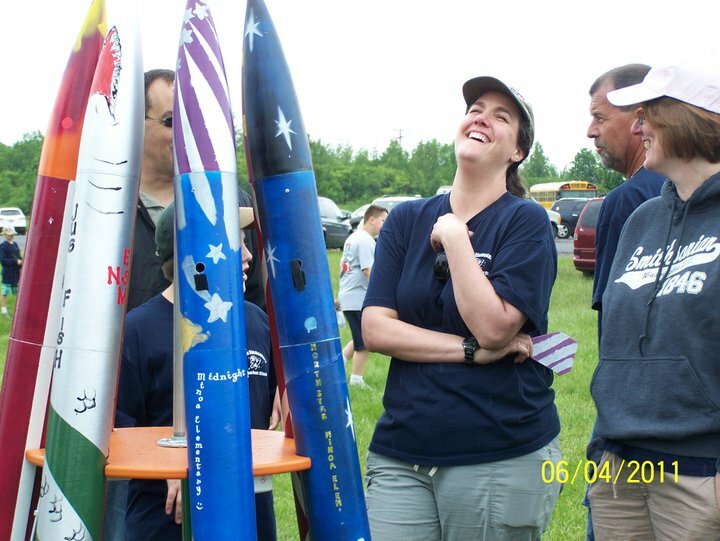 Caught by surprise having a laugh with some volunteers with our high powered rockets. I love my job teaching at Minoa Elementary in the East Syracuse-Minoa School District. My district is extremely supportive of me, and I look for any way to incorporate STEAM activities into my day, but it is usually after school. From space education, launching large five foot high powered rockets, Lego robotics, NASA moon rocks, writing NASA curriculum to taking large groups to Washington, D.C. or Space Camp, Canada, I try to inspire students many ways! I am very excited about going to sea in Alaska on NOAA Ship Rainier! This will give me many more experiences to bring back to my school and community. My dream is for kids to be inspired by me to follow their own STEAM paths and careers. Some of my best adventures have been around water. To begin, I grew up on the large St. Lawrence River in northern New York State and could practically swim before I walked. A true passion of mine for over 10 years is sailing on the Maine-based, National Heritage schooner Isaac H. Evans. While sailing, the wind takes you where it pleases and the chef cooks on a wood stove in a wooden galley. This is where I learned that you sleep in a “berth”, go the to the bathroom in a “head” and you wash your hands in a “basin” (Think about it – you don’t want to use the word “sink” on a boat!). Another water-based, but thrilling experience is when I went cage diving with Great White sharks off the coast of Africa! Little did I know that the shark was going to grab the chum right in front of me – yikes!! Being on water is natural for me and I love it! Having the experience of being on a hydrographic research vessel is very unique. Hydrographic research is the study of our coastal waters – updating charts, maybe checking tides or the bottom of a bay/strait or going on smaller boats to look closer at the shoreline. I look forward to learning all I can about it! This is all very exciting for me, but I must admit I am a bit nervous. Who would think that someone who swam with sharks would be more nervous about this, but I am. Since my dream is to inspire more children and adults, I want to do a great job! Some of my adventures that are not based on water are attending Honeywell’s Space and Advanced Space Academies for educators, getting VIP tours of various NASA facilities, sleeping in a car to see Space Shuttle Atlantis lift off (oooohh my back and neck hurt after that experience! ), star gazing in Death Valley, CA, paragliding off a mountain in Africa and traveling in Europe. Another passion (and something I get the strangest looks for) is showing off my Space Academy Blue Flight Suit at any appropriate occasion with other space enthusiasts! We are like our own little family. 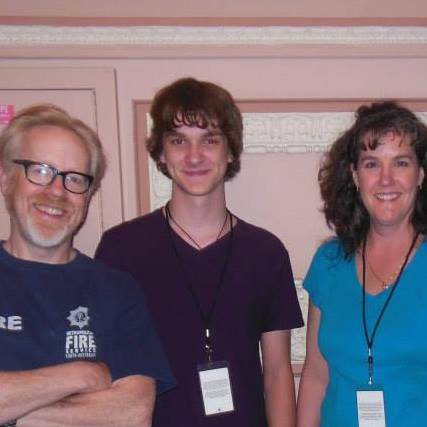 My son and I with Mythbuster Adam Savage! STEAM Awesomeness! do-it-yourself projects. I take a great deal of pride in seeking new adventures to inspire both adults and children! Thank you for following me on this latest adventure! 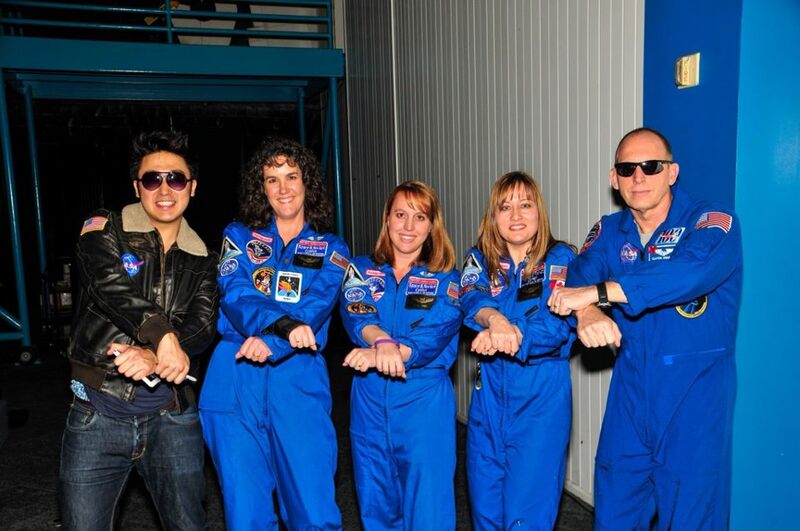 This entry was posted in 2015, NOAA Ocean Service, NOAA Teacher at Sea, Rebecca Loy and tagged East Syracuse Minoa Schools, Honeywell educators at space academy, introduction, Isaac H. Evans. Bookmark the permalink. Following your adventure with envy and excitement! So glad you are following!! When I read rockhound I figured it was you GregR. While I am writing my blog for an elementary level I am sure there will be things of interest for all grade levels. It is truly incredible here!! I will be posting my second blog soon.